Protest for the release of Raif Badawi outside the Saudi embassy in London. Demotix/See Li. All rights reserved. Immediately after the Paris attacks, Douglas Murray proclaimed that to uphold freedom of speech, every newspaper and magazine in Europe had to ‘spread the risk’ by simultaneously publishing Charlie Hebdo’s depictions of the Prophet Muhammad. His battle cry was reminiscent of the challenge set by the late Christopher Hitchens who in response to Ayatollah Khomeini’s fatwa on Salman Rushdie, called for all those responsible for publication of the Satanic Verses to sign a petition considering themselves co-responsible. Hitchens drew inspiration from the legend of the Danish volunteers in Nazi occupation who said that if the Jews had to wear yellow stars, they would too. In both instances the west failed to take up the challenge, creating the impression for some that the extremists had succeeded in imposing Islamic blasphemy law in Europe. However, in the case of Charlie Hebdo, it can be argued that the media opted against re-publishing the cartoons of the Prophet Muhammad not out of fear (although this undoubtedly played a part), but because doing so would be considered an attack by the western media on all Muslims. We must remember that Islam is a deterritorialised religion; it has no geographic borders, so by publishing cartoons that ridicule the Prophet Muhammad, we are simply erecting mental borders in the minds, attitudes and discourses of European Muslims; consequently pushing them like pariahs into the bosom of the fundamentalists. Yes, ‘spreading the risk’ is a great idea, but the aim should be to spread the risk alongside Muslims by unilaterally amplifying the voice of those moderate movements challenging the hardliners and doctrines manufactured by religious scholars, of past and present. The western media should be the ‘Danish volunteers’ to those freethinking Muslims who are continually losing out to the fundamentalists, because without them reform in Islam is not possible. Trumpeting Muslim rather than western voices is critical to challenging fundamentalism because as Edward Said said, “there is a disquieting tendency for Orientalists to speak for the Orient”, allowing ‘students’ of Islam to supply western culture with all that it knows about the orient. We have a system whereby it is the western disciplines (the media, government, universities, and geopolitical strategists), not the people of the orient who decide which issues are considered of importance; and it is the disciplines, not the desires of the people of the orient which present us with methods to explore the issues which arise in the orient. By remaining faithful to our Orientalist narrative of Islam, we only hamstring our ability to see clearly. But if we support those Muslim voices on the frontline against fundamentalism, our wisdom would multiply and it would accelerate us beyond the trite hypocrisy of so much western media. This means pushing aside the PhD interpretations of Islam by New Atheists Sam Harris and Richard Dawkins that bring no change to the lives of the suppressed; supporting instead those voices that truly represent the desires and struggles of so many Muslims in the orient and in Europe. If the western media want a Muslim freethinker to champion, then they need look no further than the liberal blogger Raif Badawi, sentenced to ten years imprisonment and 1000 lashes for criticising Islam and the theocratic monarchy of Saudi Arabia. His struggle against the state-sponsored fundamentalism of Saudi Arabia should have the backing of every western publication. Instead, the ‘free west’ meekly whispers a condemnation of Saudi Arabia’s repressive regime, choosing instead to favour geopolitics over freedom of speech in the orient, thus helping to create the repressive environment that allows extremism to flourish. 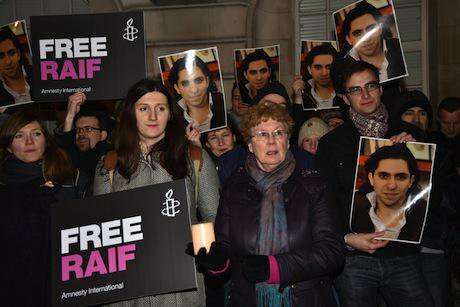 With western ‘muscle’ behind them, the struggles of activists such as Raif Badawi will open the prison door for fellow activists to begin to peer outside. At first, it will seem unnatural and taboo to act, think, and speak freely as many suppressed Muslims have internalised their imprisonment; but in time, a culture of free speech will cultivate, pillared on reason, not obedience. The backing of the west is critical in conditioning free speech as a natural cultural pattern in Saudi Arabia and other Islamic countries including Pakistan and Iran, because without an uproar from the people that is loud enough to be heard, the state and non-state religious authorities will have no impetus to reform. The reason there was such a large civil outcry in France over the Charlie Hebdo attacks, yet no such outcry from within Saudi Arabia following the public flogging of Raif Badawi which occurred within days of each other, was because France has a strong civil society which understands democratic values, whilst no such phenomenon exists in Saudi Arabia. We only need to look back to the Arab Spring to see that entrenched totalitarian systems can be torn down from within if the people are no longer afraid of speaking out against repressive authority. If we can succeed in ‘spreading the risk’, I believe in time we will see another Muslim-led popular movement sweeping the orient and even Europe, this time tearing down the fundamentalist grip on Islam.